There is no doubt that multiple display units can enhance your productivity, but not each of us wishes a pair of displays all the time. If you get yourself in a state in where a dual display screen might be beneficial, however, you may without difficulty make your android device a second display of your computer. 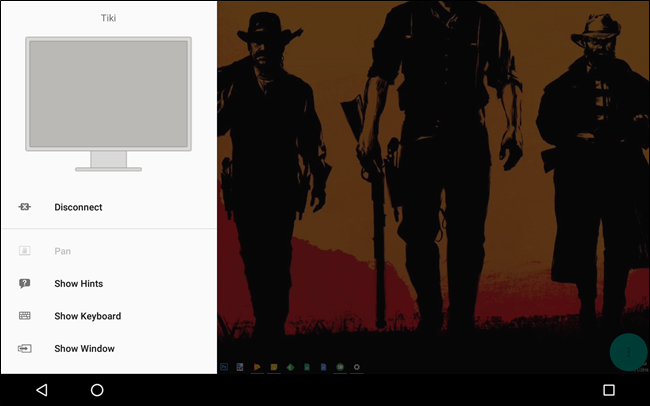 In this Android Guide, We'll walk you through the steps to set up and use an Android device as a second monitor for your PC or Mac. You just need to download iDisplay app on your Android device (from the Play Store). 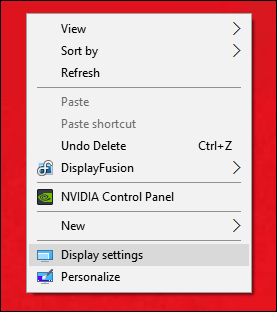 Since the iDisplay installation is basically automated so let’s focus on how to set it up on the computer. I’ll be using a Desktop PC for this guide, but the process should be similar enough on a Mac. First, double-click the downloaded driver file to start the process. 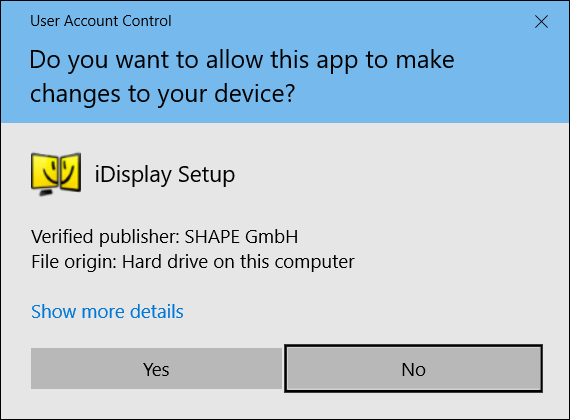 Depending on what version of Windows you’re using, you may or may not see a warning screen—if you get this, click “Yes” to allow the program to install. The set up process is pretty simple—just click over and allow iDisplay do its job. It doesn’t bundled any advertising garbage or some thing like that, so you don’t have to worry about the ask toolbar displaying on Firefox or internet explorer the next time you open up your web browser. Depending on the performance of your computer, it may take a couple of minutes for the set up process to complete. 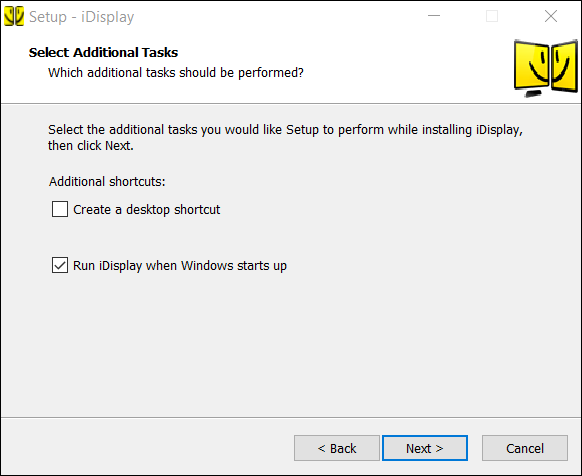 The display screen will possibly flicker some instances as the display driver is installed, and once it’s completed you’ll need to restart your PC. After rebooting, the iDisplay driver automatically start—check your system tray to ensure. 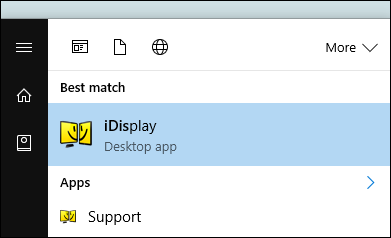 If it didn’t begin, just press the Windows key on your keyboard and start typing “iDisplay.” it should to show up in the menu, and you can start it from there. Now that the iDisplay server is ready and running on Windows machine, go ahead and start iDisplay on your Android device. There is literally no set up process involve here—just launch it, and it’ll start searching out a computer of running the iDisplay server. iDisplay uses a hybrid connection, so it works with Wi-Fi and/or USB. It’s rad. In case you’re in an area where the wi-fi signals are weak (or it’s a public connection), simply plug in a usb cable. At home? Wi-Fi connection should do the process simply good. Among the two, i observed little or no latency on wi-fi versus a usb connection, so I can comfortably recommend both. 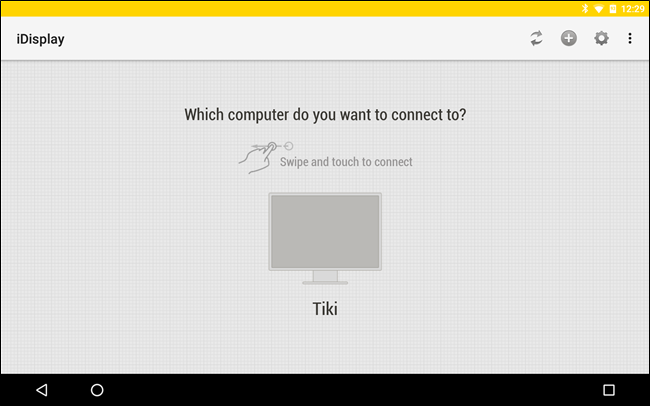 Once iDisplay has discovered the computer you need to connect to, tap it. 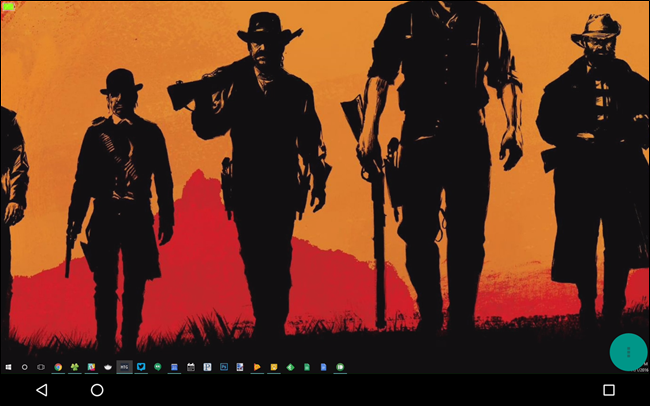 If you have multiple computers, you may swipe to cycle through them. 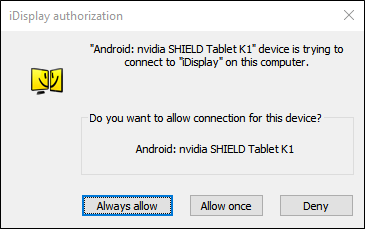 A warning message will pop up at the computer when it’s trying to establish a connection—if you’re using your personal computer (which I am sure that you are), just click on “Always Allow” so this warning won’t display up next time for that specific Android device. One more warning pop up will show up to let you know that your display screen will flicker while the driver loads, and a couple of seconds later the Android device will show your Desktop screen. 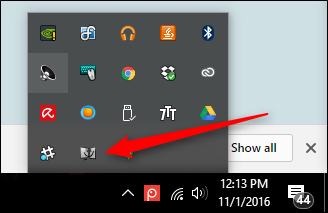 Depending on what version of Windows you are running on your PC, this may look specific than my screenshots—the concept, however, remains the same. You may deal with your new Phone display as anything hard-wired: you can pass it from right to left, top to bottom; choose to increase it; or even make it the main display screen. Once you’re completed the process, disconnecting the display is simply as easy as connecting it. First, tap the green action button in the bottom right corner (you have to tap it—this can not be clicked with the computer's mouse). This will open the menu in the left side, there you can select “Disconnect.” once you tap that, your computer screen will flicker once again as the server disconnects, and the whole thing will go back to normal. There are a few options really worth noting within the Settings Menu. 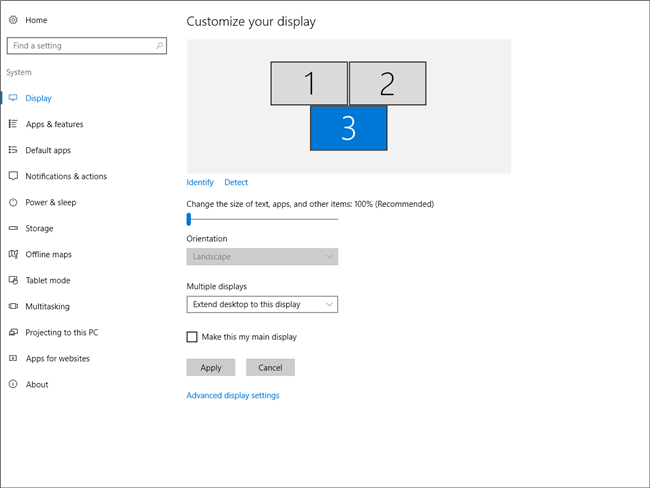 They are mostly self-explanatory, but definitely you should check in case you want to make the most out of your 2nd display screen. Definitely take a look at the Resolution option–depending on the resolution of your Android device, you may want to tweak this option so that windows and icons don’t show up all tiny. Experiment and locate the best settings that work for you. 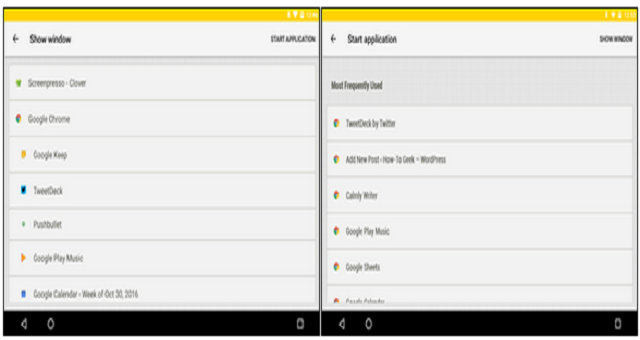 Android device can be useful as an productivity machine, but more often they’re simply not enough. Using iDisplay, you can simply switch gears and use your Android phone or tablet as a 2nd screen of your laptop or desktop.